Sometimes you get into some kind of gaming-depression, that’s not just something that I personally experienced, because my friends know this too. We’ve all seen so many games over the decades that you sometimes get tired of a certain type of game or genre. This happened to me and my friends with shooter games for example. Then you start to try out other genres for a while to have fun again, and then it happens that you come back to the other genre again if you are in the mood for it. I have several gaming buddies, and last week I’ve been online with one of them. We got the idea to play something together and we had shooter games on the list. We thought it’s been a while since we played this genre. We discovered that we both have Sniper Elite V2 in our library and my buddy said that this game would have a co-op campaign. We always thought there wouldn’t be enough games with co-op campaigns. Sure, there are some, but co-op games for two people or more are not exactly the type of game you find in mass. It’s usually either a singleplayer or team versus team multiplayer game. But playing a campaign together with a friend, that is of course always fun. We installed Sniper Elite V2 to take a look. It’s funny, you find so many bargains today that your game library on Steam grows to a three digit number but you probably didn’t even play 10% of the games you own. That’s not just me, my friends have the same problem. So, where are the gems in the library that you should have tested earlier? That’s a legitimate question that we sometimes ask! 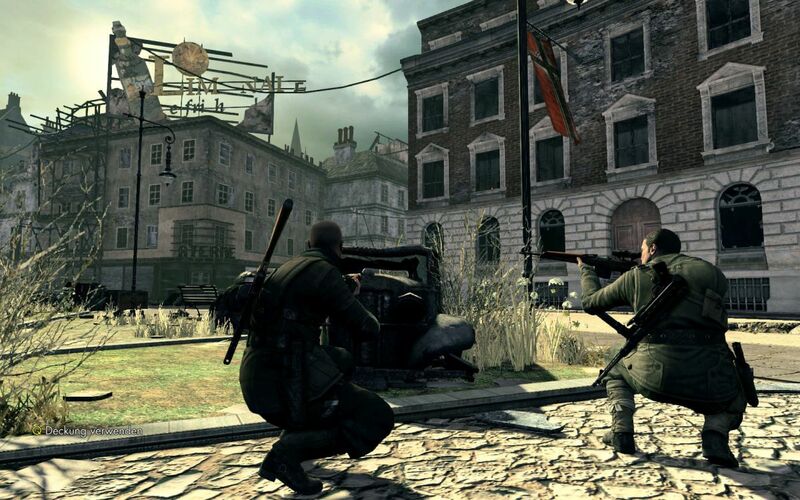 This weekend, it turned out that Sniper Elite V2 actually was one of those hidden gems in our game library. We had quite a lot of fun with the game this weekend. Playing a whole campaign and several missions together with a friend, this is of course much more fun compared to playing through a game campaign alone. As the name of the game implies, you’re a Sniper, and if you don’t play it alone, your friend too! The game is set in the World War II and there are some very interesting missions. It’s an older game, but the graphic is still fine and the mission maps are very well designed. I’ve seen some cool details on our missions so that I really can’t complain. We played this with the most difficult setting because well, we are gaming freaks. I liked how enemies were hidden behind windows or other objects and as you would expect, the game is pretty much about street to street sniper duels, or about taking out enemies in general. Sometimes you have to hide at a position and find the enemy snipers in the building on the other side, sometimes you have to kill other troops or you need to destroy vehicles. It’s pretty much a “seek and destroy” game and playing the missions with a friend is really fun because you can coordinate things together. Apart from that you have this quite brutal kill cam that shows you the path of the bullet and this alone gave us some “What the fu..” moments. But what I liked the most was that the difficulty increased with each mission when we talk about distances. Taking someone out in the game at 100 meters is the one thing, but killing the enemy at 300 meters with the first shot is another challenge. I also had the impression that enemies were better hidden in later missions, which lead to situation where we needed some time to find out where the shots came from. As said, playing this with a friend together is so much fun! Just in case you have Sniper Elite V2 in your library and a friend too, and in case you both never played the game… give it a try! This is really a nice co-op game to play through! I got tired of Civilization as soon as I remembered how to play it. I haven’t gotten into Mass Effects yet. Not enough time to learn it. Maybe in another week? Mass Effect is one of the greatest singleplayer RPG’s I played. The whol trilogy is awesome. I pretty much loved the story and the setting… definitely a game that you should play at some point! Civilization is indeed a mood things… sometimes it’s just awesome but you can indeed get tired of it. When it comes to strategy, I prefer Europa Universalis IV anyway, but this is a bit difficult to get into because it has a learning curve and the difficulty is there too.